Anytime, anywhere...God hears your cry! Moms are just everyday people who carry extraordinary loads of responsibility. They are on duty around the clock and must be able to pray on their feet: at the foot of their children's sickbeds, from the front seats of their minivans, and standing at their kitchen sinks. If you're a mom who struggles to find time to talk to God between diaper changes, soccer games, and homework assignments, rest assured that He doesn't require a formal setting or fancy words. He hears every solemn plea for wisdom, every panicky cry for help, every whispered prayer for forgiveness. So if you have very little time but want to connect with God, read this book! Inside, you'll find simple, unpretentious prayers from everyday moms that you can pray over your life to help you overcome the challenges you face every day. Anytime Prayers For Everyday Moms will help you experience the peace and wisdom that come from God's presence and find much-needed inspiration from the many Scriptures that are included. Let your heart be encouraged that God hears and answers your prayers. What any mom needs on a particular day is as varied as her to-do list, but every mom needs God's wisdom, power, and guidance. Whether asking God for the stamina to simply make it through the day, praying for a child in need, or praising God for the blessings of home and family, this book is a helpful resource to mothers. 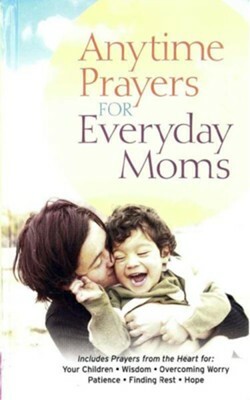 I'm the author/artist and I want to review Anytime Prayers for Everyday Moms - eBook.